In SharePoint 2010, when you have a list that allows attachments and also has required fields, if not all the required fields are filled out, the attachments disappear when the page reloads to display error text. This is a known bug, but you can work around it by doing custom validation with PreSaveAction(), ensuring that all required fields are filled out before submission. But, if you have a people picker field, the resolution of the entered name happens asynchronously, and might not resolve before PreSaveAction runs. By combining SpServices.SPFindPeoplePicker and some custom jQuery, you can make sure that the people picker has resolved before the form submits. Assuming you have a people picker field names “Contact Person” use SpServices to get a handle on the field and call checkNames to start resolving the people picker. When a people picker resolves, it adds a span with the class “ms-entity-resolved” to the row. You can then look for that span to make sure that a name has been entered and resolved. Please enter a contact person. Click the checkmark and wait for the name to resolve before saving your work. The code above will add a descriptive error after the description for the people picker. Be sure to give your users a descriptive error so that if the people picker resolves in the meantime, they’ll know what to do. 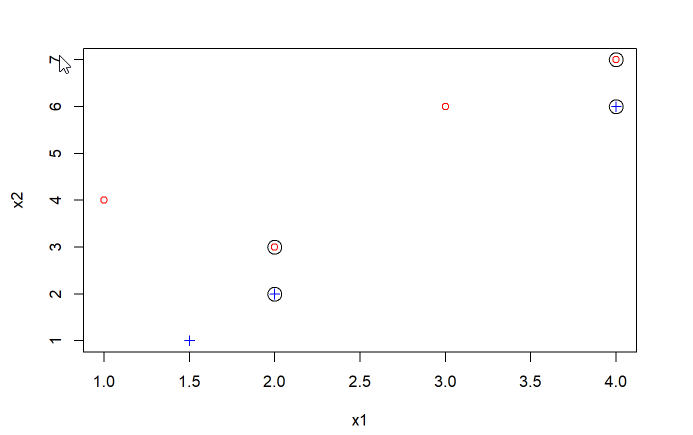 Assuming this is your only required field, here’s the entire PreSaveAction function. That’s all well and good if you have short values and a long list of them. But, if you happen to have long values and a short list of them, SharePoint’s UI choice is less than spectacular. As you can see in the image, most of the values are hidden in the select box. 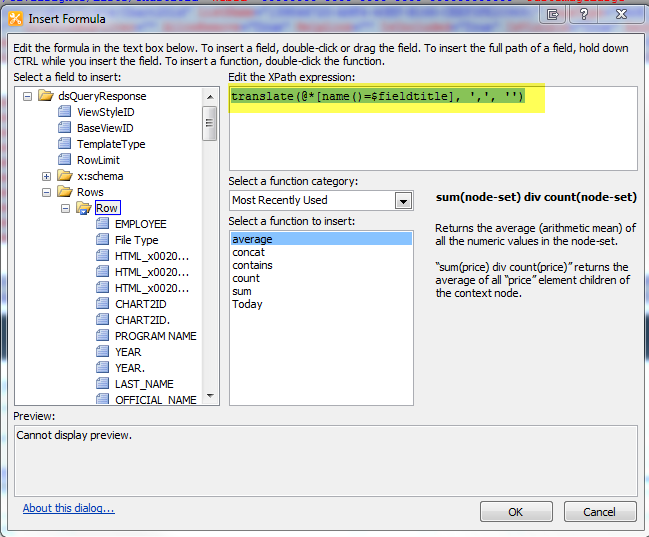 Marc Anderson has a function in his popular SpServices library to resize the select boxes to show the complete value. But, that’s not always preferable – as that can make your page very, very wide. Wouldn’t it be nice if you could just make a checkbox interface instead of the multi-select interface? Why, yes, yes it would. And now you can. There are a few moving parts here. I’ll try to break it down. First, we need a way to select and unselect choices in the multi-select UI. It’s not as easy as just highlighting a value and using jQuery to “click” the add or remove button. Believe me, I tried that. Happily, I found someone else that grappled with this issue, and he got me most of the way there. I had to tweak a couple of things, because I had multiple multi-select fields on a single form, and because I know my users well enough to know that they’ll go crazy checking and unchecking things. So, here are my add choice and remove choice functions. Next, we need a function to draw the checkboxes to the screen. I wanted to make this as simple as possible, so this same function draws the checkboxes, hides the old UI, and attaches the remove and add choice functions to the click events of the checkboxes. Showing both the standard and checkbox UI. Of course, around here, we’re integrating this with SPServices, to filter the multi-select. For that, you need a few more steps. First, you’ll need a copy of SPServices in your site, and you’ll need to include a reference to SPServices in your text file. Next, you’ll need to make a function that will work as a call-back to the SPServices.SPFilterDropdown or SPCascadeDropdowns function. Functions passed as callbacks can’t have parameters (at least, I haven’t figured out how to do it). So, you’ll need a wrapper function for drawCheckboxes that passes in the column you want. This is convenient because you can also do other stuff at the same time, if need be. Here’s my example, using a filter. Here’s the complete file for using checkboxes with SpServices. Note, there are multiple parts you’ll need to customize in here. Now that we have adding forms figured out, we need to do something about editing. It’s essentially the same, but you need to set the checkboxes that require setting. Again, for this, we’re using SPServices, and we need a few more function calls. We need a couple of helper functions to set the checkboxes. The first sets a checkbox’s selected property to true based on the value of the checkbox. The second takes in a string as returned by spSpervices GetListItems for multi-select fields and the column name and loops through the string, setting each checkbox. The string returned is a series of ID’s and values, separated by semi-colons and hash tags. So, we’ll split the string on the ;# combo, and then check only when we have a value, not a number. Caveat – if your values ARE numbers, this won’t work for you, and you’d need to do check every other value, instead of the textual values. Step two – get the ID from the query string. Just like in the add scenario, you’ll need to build your checkboxes. You want to build them before you try to check them, or this won’t work. For brevity, you can refer to the completed text file for this section, since it’s no different than the add form. My test list is called “Educational Effort.” Here I’m passing in a CAML query to get just the item we’re editing. I’ve returned more viewfields than you’d really need. But, you get the idea. If we have a successful status, we then set the value of the checkboxes, using our helper function from above.
} //end if status = success. And, voila – automatically checked checkboxes. Edit page with auto-checked checkboxes. Here’s the complete file for an edit form. Again, note that you’ll need to customize for your environment. As usual, feel free to point out places where this could be optimized, tweaked, etc. I’ve testing in IE 10, Chrome and Firefox, and it seems to be working for me. 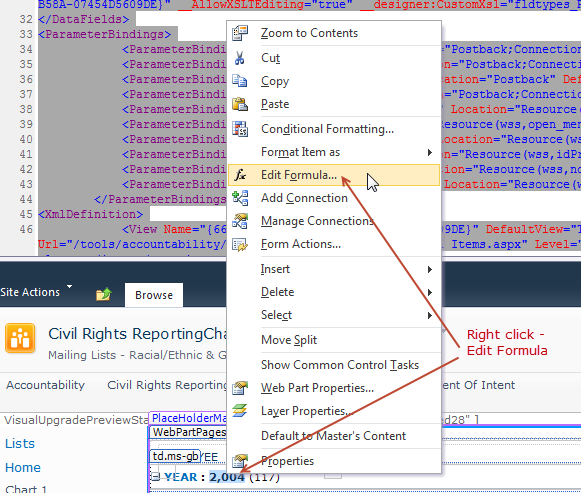 A common issue in SharePoint 2010 is dealing with linking 2 lists via a look-up column. That’s easy-peasy. But, what happens when you want to display a view of a record in the main list? By default, you get a semi-colon delimited list of the items from the look-up list, each linked to their record in the look-up list. The standard behavior – opening the related item’s display form. That might be fine in some instances, but what if you want to do something a bit more user-friendly? For example, what if you want to link each look-up item to a page that displays the look-up item’s data and some related data? Well, you could do that by customizing the standard display page of the look-up table. But, if you do that, you’ll still get the edit ribbon for the look-up item. I’m not a huge fan of the edit ribbon. I’d rather my users have a more standard web experience. 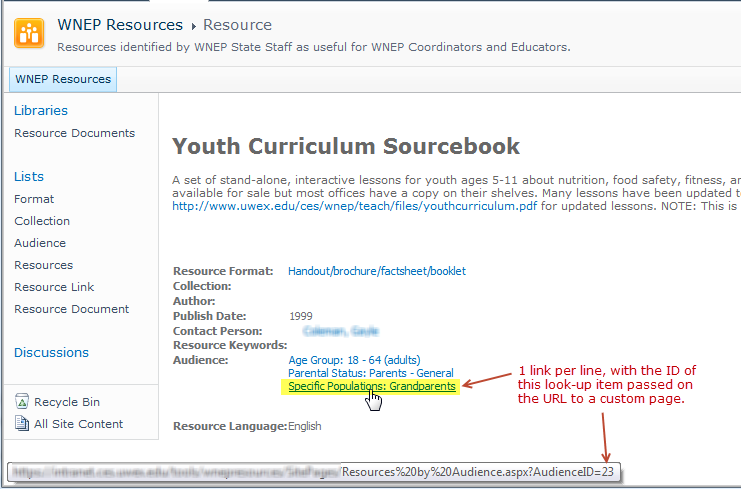 So, I want to link each look-up item to a custom web part page, that pulls in data based on the ID of the item. The best way that I’ve found to do this is to create a custom XSL template, and apply it to the output of your multi-select look-up column in a Data View Web Part. There are a couple of things to understand about how multi-select look-up columns work. 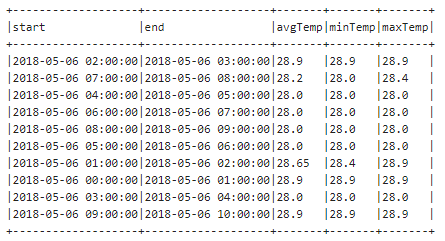 For each column of this type, there are 2 data fields returned in a DVWP datasource. One of the fields includes the links to the item’s display form. The other field does not. 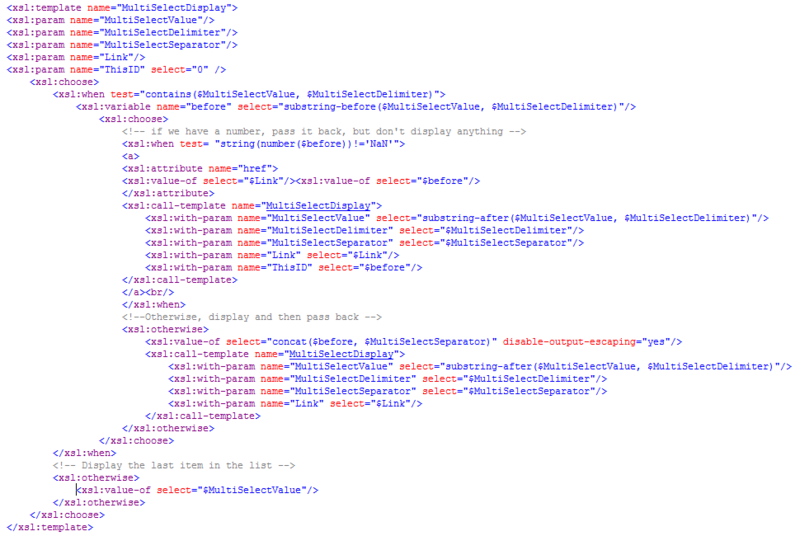 The field you want to use with the custom XSL Template below is the one that does not already contain links. The field you want will always be the field name with a period (.) appended to the end. 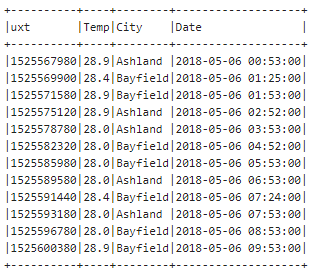 This field will contain data that looks like so: ID;Title – where the ID is the numeric ID of the item and Title is the actual title of the item. (or whichever field you used for the look-up). The always helpful Marc Anderson already had a great sample template out there for handling a similar problem. I just took his template 1 step further. Image Version of the Template – pretty colors! How to call the XSLT from within your DVWP. Finished Solution – 1 item per line, linked to a custom page. And, that should do it! This adds a lot of XSLT to your page that is designed to allow for different types of group headers. In this case you know what your group header is going to be, and you could probably clean up some of the XSLT for faster performance. I’ve yet to do that, though. If you do, let me know! Note: If you need to just remove the comma in a column of data (not a header) the approach here works. His number-format formulas did not work for me in the header. You have a list or library. You want all authenticated users to be able to add items to the list. But, once the item is created, you need to limit permissions to a certain subset of users, based on a column in the list or library. In my example, I have an event registration list. When an item is added to the list, permissions should be restricted to a county security group based on the county chosen in the event registration. Set up your county list. It should have 2 columns: title, group. Group is person column set to the security group. Set up your event registration list. Include a county column which is a lookup to the list you created in step 1. I based my list off of a content type, so that I could do a reusable workflow. You can also use a list workflow, though. The main list – including the lookup column. Inside the Impersonation Step, click Action -> Set a Workflow Variable. Name your variable “County” to match your lookup list. Click on “value” to set the value. Click the “fx” button. 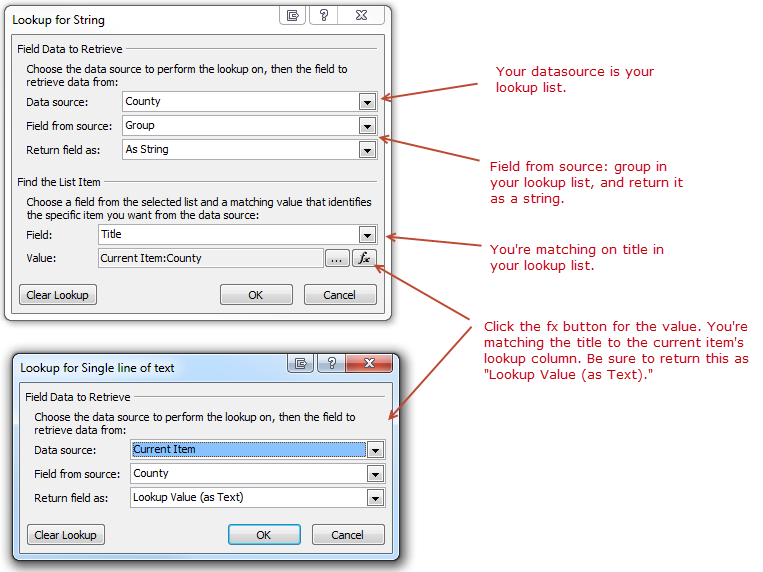 Using the lookup field to set the security group variable. Select Action -> Replace List Item Permissions. Click “these permissions.” Click “Add.” Click the permissions you want to replace. In my case, it was “Contribute.” Click “Choose.” Click “Workflow lookup for a user.” In the “Field Data to Retrieve” section, set the Data source to your lookup list. Set the Field from source to your “Group” column. 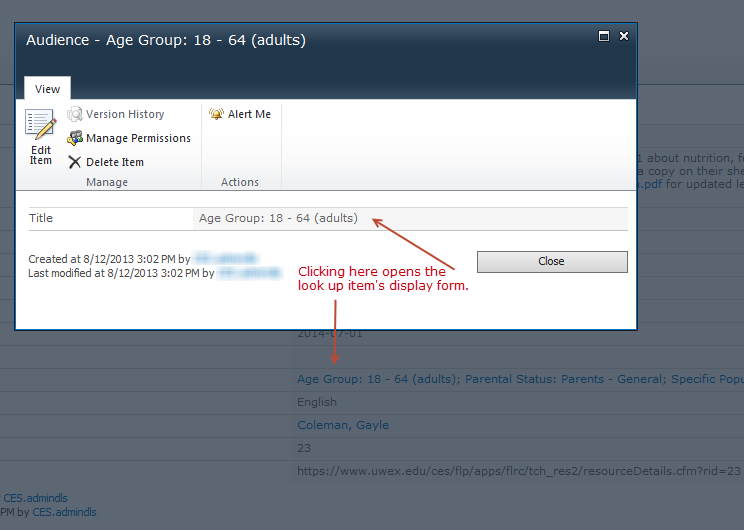 Set Return field as to “String.” In the “Find the List Item” section, set your field to your “Group” field. Click the “fx” button. 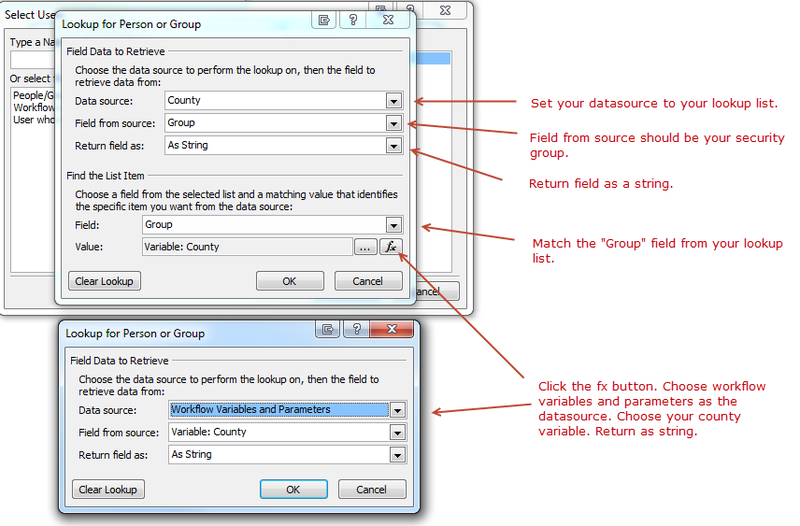 In the “Lookup for Person or Group” dialog, set your Data source to “Workflow Variables and Parameters.” Set your Field from source field to the variable set in step 4. Set Return field as to “As String.” Click “ok” on all dialog boxes. Click “this list” and select “Current Item.” Repeat these steps for each set of permissions you want to replace. Return the security group matched to the local variable. Your complete workflow should look something like this. (Note, I added a couple of log messages not defined in the steps. Feel free to add them or leave them out. Publish and test your workflow. I set mine to run automatically whenever a new item is created. Test your permissions.